These stars, though still shrouded in dust and hydrogen gas, are some of the youngest and most massive stars in the galaxy. They're part of the Omega Nebula, which for 200 years has been a sort of cosmic inkblot test. Just about every astronomer who observes this nebula comes away with a different sense of what the thing looks like. 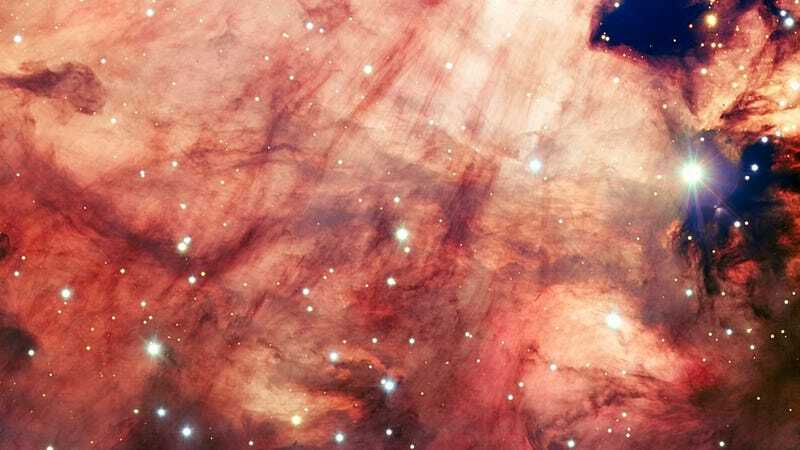 Its first known discoverer, the 19th century astronomer John Herschel, decided the nebula looked like the Greek letter omega, giving it its first name. Since then, other astronomers have called it the Horseshoe Nebula - which admittedly would closely resemble the omega symbol - as well as the Swan Nebula, the Checkmark Nebula, and my personal favorite, the Lobster Nebula. Its official names are Messier 17 and NGC 6618, so apparently astronomers can't even settle on a single designation for the damn thing. In this particular section of the nebula, the newest stars on the scene - dazzlingly bright and shining blue-white - light up the whole ensemble. The nebula's smoky-looking ribbons of dust stand in silhouette against the glowing gas. The dominant reddish colours of this portion of the cloud-like expanse, arise from hydrogen gas, glowing under the influence of the intense ultraviolet rays from the hot young stars. The nebula is located about 6500 light-years away in the constellation of Sagittarius (The Archer). A popular target of astronomers, this illuminated gas and dust field ranks as one of the youngest and most active stellar nurseries for massive stars in the Milky Way. Here's the VLT's full image of the nebula.